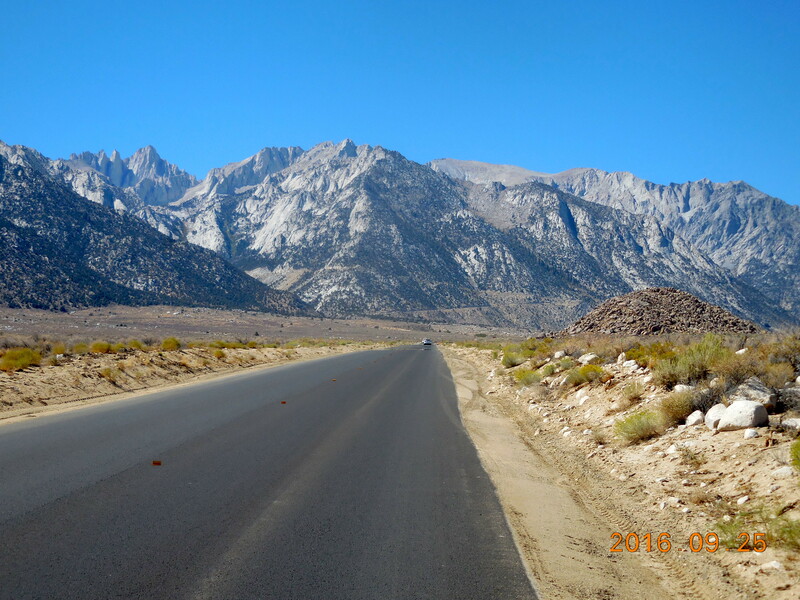 After we got back from our main road trip in 2016, Tanya went to visit family and I headed back to the Eastern Sierra in California to do a few of the great climbs off Highway 395. I’d done many of these climbs in 2011 when I came out to do the Markleeville Death Ride in July, and then the Everest Challenge in September, but they are so good I wanted to ride them again. These are some of the most amazing climbs in the country and they rival the great climbs of the big European Grand Tours for length and difficulty. What they lack is the sense of history, the stories of the classic battles of the Grand Tours, and the names spray painted on the roads: Froome, Armstrong, Valverde, Indurain, Hinault. But the views are spectacular and the climbing amazing. 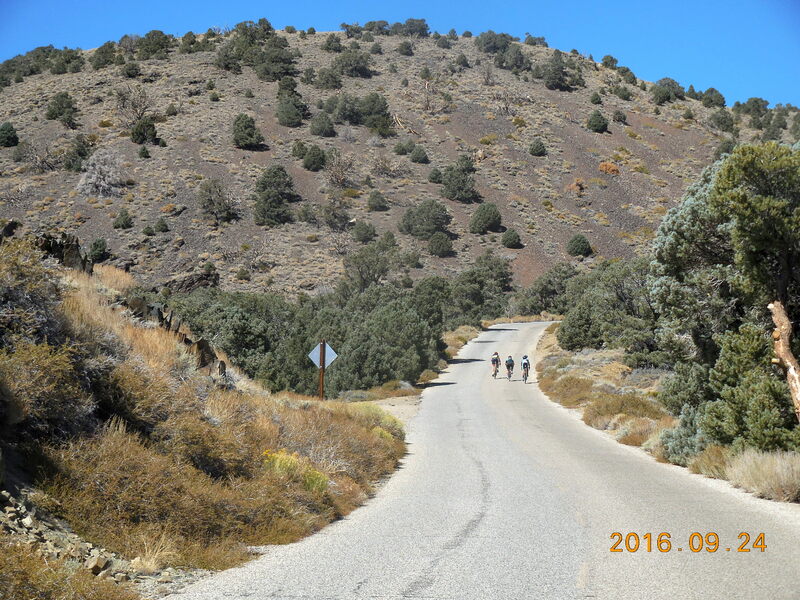 Bill Oetinger has a great page where he gives incredible descriptions of some of the big Eastern Sierra climbs, and Tom Meloy has a wonderful page where he compares these climbs with the top climbs in Europe. California is an amazing place to ride and there seem to be more big organized rides there than in any other state. For example, there is the California Triple Crown, where you have to finish 3 Double Centuries in a year, and there are 25 different ones to choose between. Another site lists an enormous number of Centuries and more. Death Ride (Tour of the California Alps). This ride is 129 miles long with 15,000 feet of climbing. 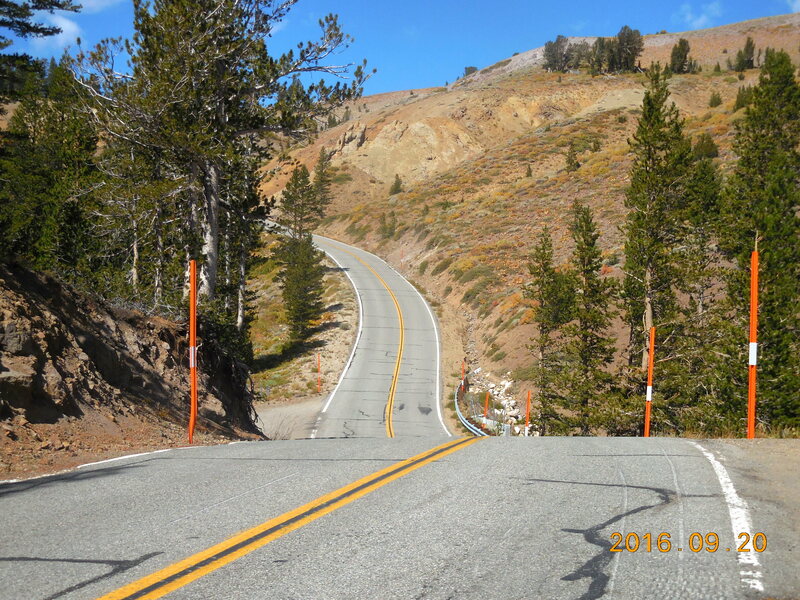 It climbs both sides of Monitor Pass, both sides of Ebbetts Pass, and finishes up Carson Pass. Alta Alpina Challenge. This has several options, including a 5-pass option that is basically the same is the Death Ride. It also has an 8-pass option which gives 20,300 feet of climbing over 198 miles. Everest Challenge. Alas, this appears to be defunct. I did it as a non-racer in 2011 and over 2 days and 208 miles we did six climbs out of Bishop and Big Pine, with a total of 29,035 feet of climbing (the height of Mt Everest). The last time the Everest Challenge was held appears to be 2014. It would be fun to organize an annual trip of friends to this area. Most of the roads in the Eastern Sierra are really good with wonderful smooth surfaces. In our experience, many of California’s roads are pretty crappy – probably as a result of Proposition 13. But the roads here are great, perhaps because this area makes most of its money on tourism, and tourists like good roads. As always, I include John Summerson’s ratings. I add (S-#) in the name to indicate that a climb is described in his book, The Complete Guide to Climbing (by Bike). The # shows the climb’s category (1, 2, HC=hors categorie). The east side of Monitor Pass is a big, open climb of 9.4 miles with 3,165 feet of climbing at a fairly consistent grade. It starts with a lovely little twisty, rocky canyon then opens up to a vast open treeless slope. Eventually you get into some big switchbacks, then about 3 miles from the top the gradient eases. Start at the intersection of Hwy 395 and Hwy 89, about 9 miles north of Walker. There’s a good parking area just east of the Fire Station. 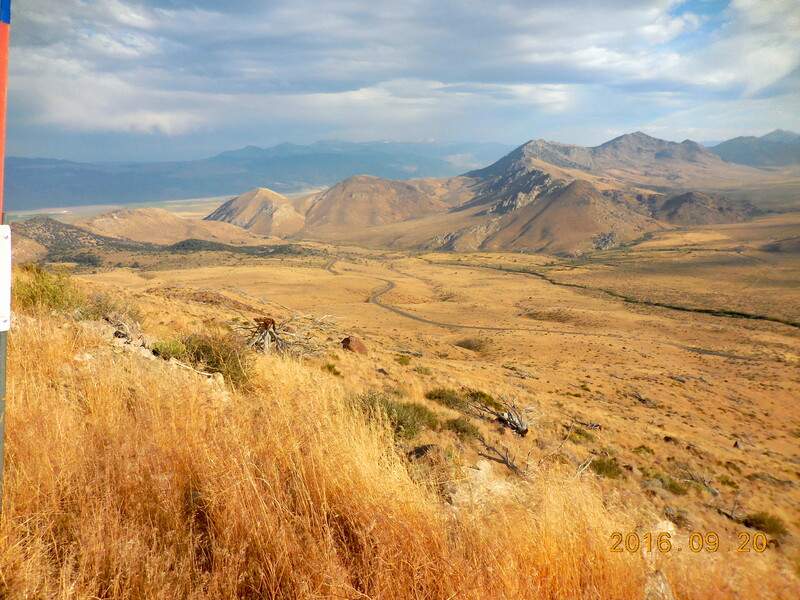 The east/north side of Ebbetts Pass (S-1/2) is one of the loveliest rides in the Eastern Sierra. It’s a lot more beautiful than the picture on the left suggests, but the weather conditions were not the best when I did it. It’s never very steep except for a couple of short steeper sections near the top, but the scenery is varied and beautiful – and the descent is simply spectacular. 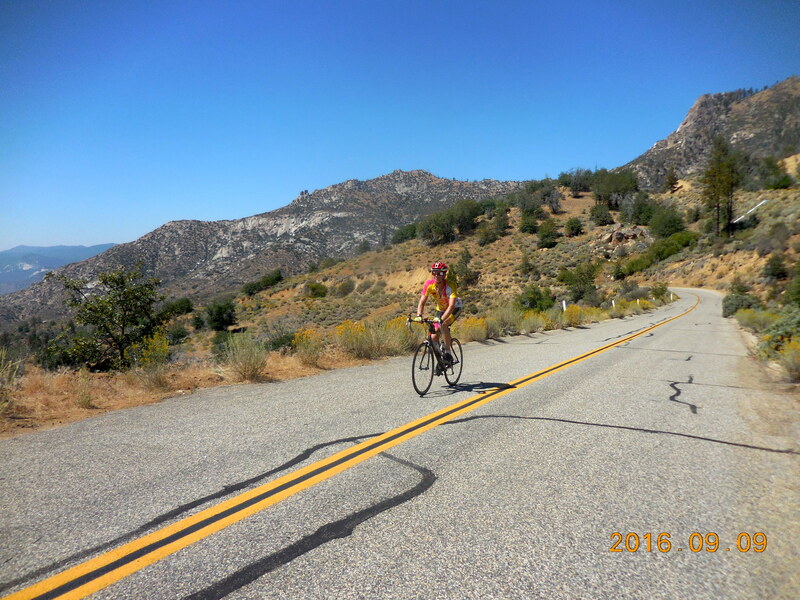 Jay Rawlins includes this climb in his “Best of the Best“, rating it as one of the 4 or 5 best rides in California. I’d ridden both sides of Ebbetts in 2011 on the Markleeville Death Ride and this time I wanted to also do Pacific Grade because it has a reputation for being super-steep. So come hell or high water – or at least rain – that’s what I did. Anyway, head west from Hwy 395 on Hwy 89 and park at the intersection of Hwy 89 and Hwy 4 near Markleville (it’s where the Monitor Pass Road comes out.) The ride up the east side of Ebbetts is 13 miles with 3,088 feet of climbing. The initial part is fairly easy and the real climbing doesn’t start till about mile 6.8. Once at the top, descend the other side for about 5.4 miles to Hermit Valley. From here it’s 2.5 miles to Pacific Grade Summit (S-3). This climb is short but fantastic. It consists mainly of very steep ramps. Fortunately each ramp is very short, except for a long steep section with a couple of switchbacks in the middle of the climb. The Pacific Grade climb is only 2.5 miles but has 980 feet of climbing. I don’t for a minute believe Summerson’s Cat 3 rating. Descend back down Pacific Grade and climb 5.4 somewhat boring miles with 1,642 feet of climbing back to Ebbetts Pass then make the incredible descent back to your car. The whole ride, out and back, is 41.6 miles and 5,820 feet of climbing (a few rollers account for the extra elevation gain). The climb is about 9.5 miles with 3,102 feet of climbing. The west side of Sonora Pass (S-1) is 9.1 miles with 3,017 feet of climbing. This side is more dramatic and more sustained than the east side. The first mile is very steep, with a vicious sting in its tail. The gradient eases but remains consistent until you reach about mile 5.7, where it steepens, turns left, and rears up again (see photo on left.) At mile 6.6 the gradient eases and stays easier to the top. Assuming you are doing both sides, go down the west side of Sonora Pass for about 9.1 miles to the bottom of the climb where a sign points left to Kennedy Meadows. Turn round here and ride back up to the top. 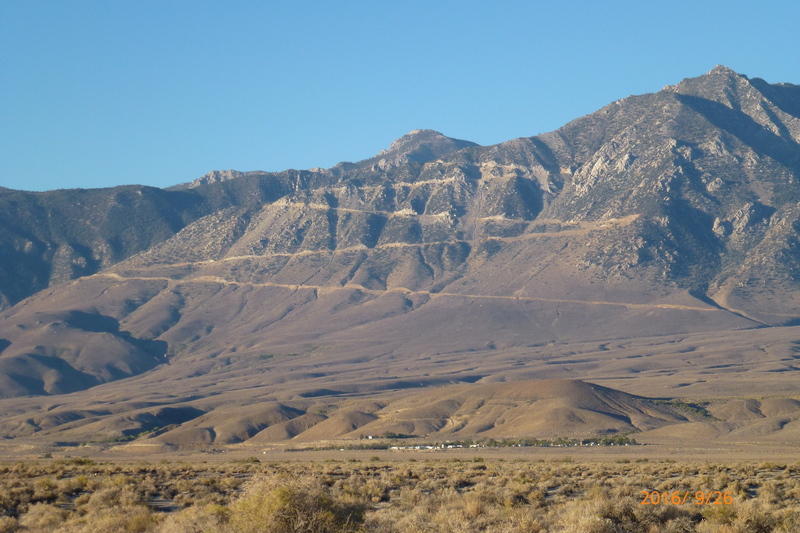 The town of Bishop has a magnificent setting, with a spectacular sweep of rugged, rocky mountains to the west. It’s a busy town, with a constant flow of traffic along the main street. These rides head straight towards the mountains before turning left and paralleling them for a while. The road surface on Hwy 168 is wonderful and traffic is light – at least after Labor Day. You can ride to Lake Sabrina or South Lake as separate rides, but since you are here it makes sense to do both together. Especially since the initial common 15 miles are fairly tedious, being relatively easy angled along monotonous straight roads. The whole ride is about 52 miles with 7,270 feet of climbing. I rode to Lake Sabrina first as I’d ridden South Lake in 2011, but some people suggest doing South Lake first because then you have an uninterrupted fast descent down 168 from Lake Sabrina. At a traffic light in the center of Bishop, go west on Hwy 168 (W. Line Street). There’s a lovely bike lane out of Bishop, which ends just before 5 miles. The initial view of the mountains is incredible but eventually the riding just becomes monotonous and tedious. There are a few steeper ramps but for the most part the riding is not too steep. After about 15 miles you reach an intersection. 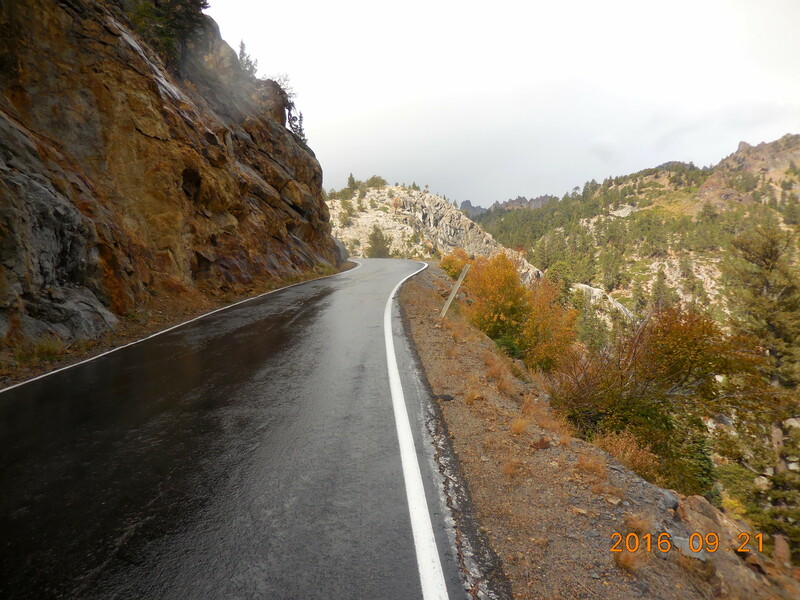 Hwy 168 continues straight, up to Lake Sabrina, which it reaches in about 4 miles with another 1,260 feet of climbing. This last 4 miles is harder and more sustained than what came before. 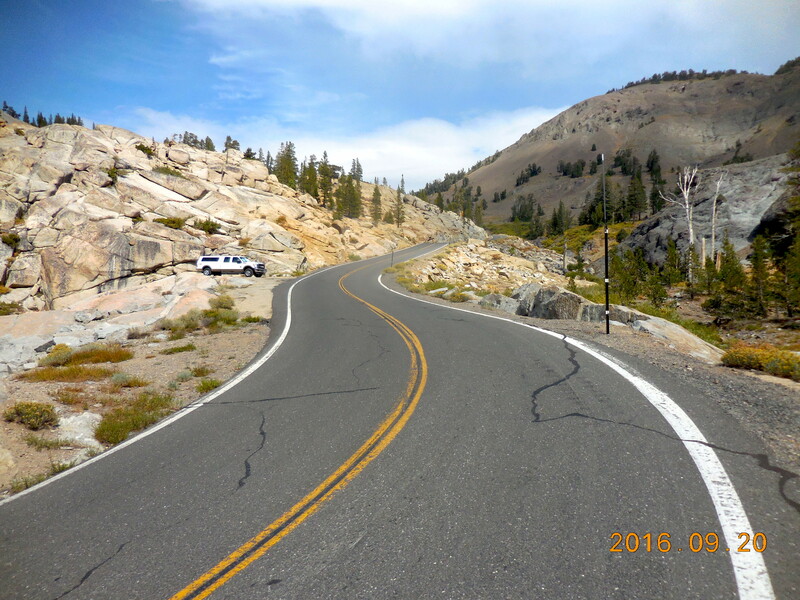 Hwy 168 ends and there is another half mile of steep rollers to the big parking area at Lake Sabrina. Ride back down for 4 miles and turn right on the South Lake road. Even though it’s another 7 miles to the lake, the first 5 miles are pretty easy. Just under 2 miles to go and you are faced with 4 steep ramps, 2 short and 2 long. It feels as if most of the 1,980 feet of ascent on this road are gained in the last 2 miles. At the lake, keep going to the big parking circle at the end of the road. I loved this climb. It’s shorter, but much prettier and more interesting than the climb to Lake Sabrina or South Lake. Here you have the mountains in your view most of the time, and the road winds more and has a couple of lovely switchbacks (which you can see in the photo). The climb is about 10.4 miles with 3,806 feet of climbing. Start in Big Pine and head west on Crocker Street. The road is easy to start, but after about 3.5 miles you reach the switchbacks and the road steepens. The gradient finally eases at mile 8.4 and you reach the parking lot after 10.4 miles. On the way down I stayed close to the middle of the road on the long fast descent because the drop-off on the right is terrifying. This is a fascinating ride, very different to the big climbs on the west side of Hwy 395. It’s a desert ride rather than a mountain ride, and is very isolated. I saw only two cars on the whole ride, and I kept my eye on my bike computer, counting down the miles to go, always wondering how long it would take to walk out if I had a mechanical problem. 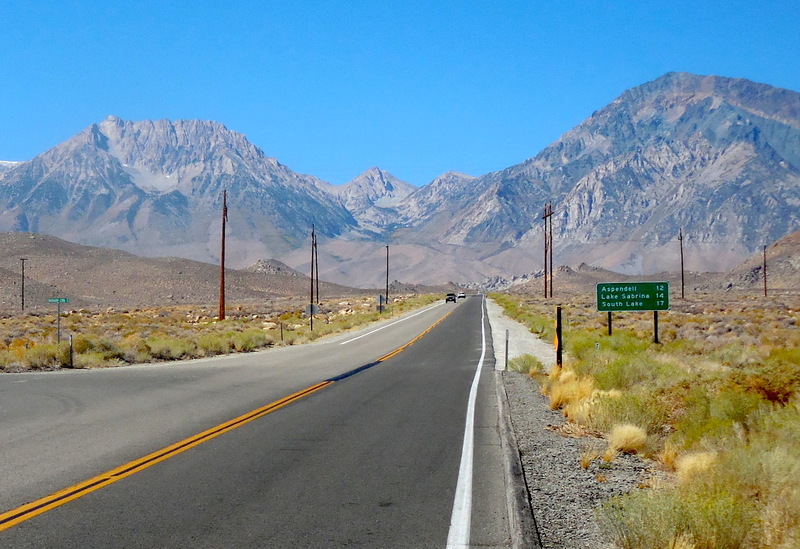 Drive east up Hwy 168 out of Big Pine, then after 2.2 miles turn right on Death Valley Road. At about mile 15.5 Waucoba Saline Rd head off to the right. I parked here because there’s no good parking at the top. The way I did it makes the climb 16 miles with 4,332 feet of climbing. Ride gently uphill for a bit under a mile then head downhill until the road flattens at mile 16. This road varies in quality from smooth to rough chip-and-seal. There’s a lot more of the latter than the former. Turn around at mile 16 and ride back up the way you came. At mile 5.6 you start going downhill then climb the steep twisty road shown in the photo, although this part is less than a mile long. At mile 7.3 the angle eases significantly and the riding becomes much easier as you ride through a shallow, Joshua tree filled valley. Shortly before the top the road becomes steep again, then you reach the top at mile 15.2 and have a lovely downhill back to the car. White Mountain, also knows as the Ancient Bristlecone Pine Forest ride, is one of the great rides out of Owens Valley. The climb is 23 miles with 6,305 feet of climbing if you just ride up. If you ride down as well, you’ll end up with 6,632 feet of climbing. The ride feels big. It’s varied and interesting, with two distinct parts: up Hwy 168 and up White Mountain Road. It has steep uphills, gentle uphills, flats, downhills, twists, and turns. It’s a strange climb though – after an gentle introductory 3 miles, the next 7 miles are steep. Then the gradient eases and there’s lots of uphill and downhill, both gentle and steep. Then the last 3.5 miles of climbing steepen again. So you pretty much start steep and end steep, which give you an impression that this is a hard ride. Park at the intersection of Hwy 395 and Hwy 168, on the northern end of Big Pine. There’s an information booth on the right of 168 with a good parking area. Ride east on Hwy 168 (some people park on Death Valley Road, 2.2 miles up Hwy 168). The real climbing starts just before mile 3. From here to mile 10 the climbing is steep, with rollers. This section is an incredible downhill, one of the best around, and you swoop round the corners and over the rollers. At mile 10 the road narrows and goes through a cut in the rock, then the gradient eases and the next 9 miles constantly change: uphill, downhill, uphill, downhill. At mile 19 the pitch steepens again and you have 3.5 miles of steep climbing with plenty of 8-15%. A final half mile of downhill and a right-hand turn takes you to the Schulman Grove Visitor Center and the parking circle, and a view of lots of ancient bristlecone pine trees. I’m not writing much about this climb as I didn’t do it on this trip. 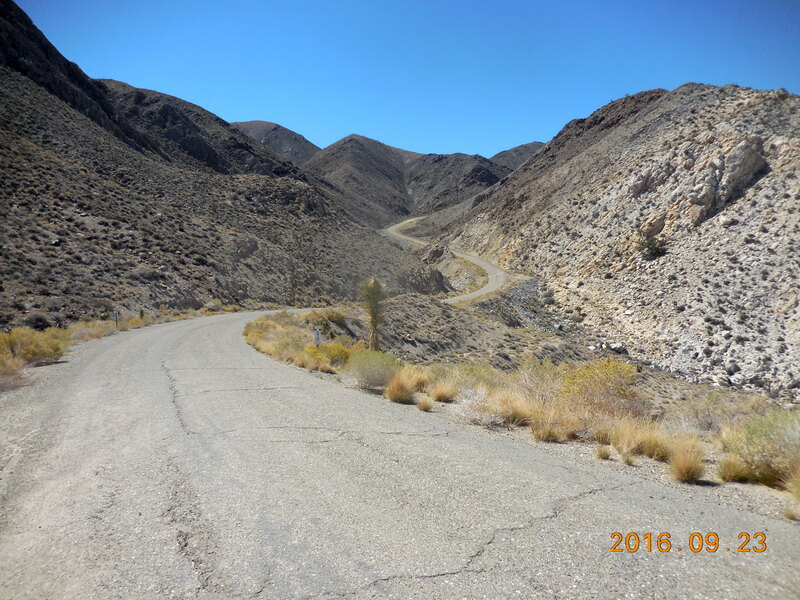 I’d previously ridden Onion Valley in 2011, and while it’s a very tough climb, I didn’t like the constant cracks running across the road, with the resultant bumps as you ride over them. But it’s one of the big hard climbs on the Eastern Sierras so you probably have to do it! It starts in the little town of Independence, heading west on Market Street, which becomes Onion Valley Road. The climb is about 12.5 miles with 5,170 feet of climbing. Lone Pine has the most sensational backdrop in America. Okay, that might be open to debate, but trust me, it really is spectacular, with Mt Whitney off in the distance. It also has one of the most sensational climbs in America – Horseshoe Meadows. This climb is big and bad, it’s long, it’s unique, it’s intimidating, it’s physically and emotionally demanding, it’s an adventure. I don’t usually like climbs where there are long straightaways, but these huge switchbacks add to the drama. If you do only one climb in the Eastern Sierra, let it be Horseshoe Meadows. The climb is 22.6 miles with 6,615 feet of climbing to the top. If you also come back down, you’ll end up with 7,040 feet of climbing. Start in Lone Pine up the Whitney Portal Road. After 3.1 miles and 825 feet of climbing, turn left on Horseshoe Meadows Road. From now on, the road is chip-and-seal, quite rough for a long way, but once you get high enough it becomes smoother. Apparently the road was constructed over three years with three different contractors doing the work. Follow the mainly flattish road until the gradient increases at mile 7.4 then increases again at mile 9. From now on you have a fairly constant gradient between 5-8%. You reach the first switchback at mile 12.1. Although the road looks pretty straight from a distance, once you are on it, it twists enough that you never see too far ahead. At mile 15.1 you see the road high above you and heading far back to the west. It’s at this point that you need your mental fortitude because you still have over 4 miles of climbing before you begin a 0.7 mile descent followed by another 1.5 miles of climbing. As I said, this is a big climb. Fortunately the last half mile is almost flat and ends at a huge parking circle. There are bathrooms and water here. The descent would be one of the best around if the road surface was better, but it’s still incredible, with spectacular views of the huge Owens Valley. The Whitney Portal climb is a monster. It’s probably the steepest and most sustained climb described in this page. It’s in-your-face, in front of you all the way as you climb. But despite this, it’s a wonderful climb, in large part because the constant views of Mt Whitney and all the cliffs are just incredible. Ridden by itself from Lone Pine, it’s about 11.9 miles with 4,480 feet of climbing. However, if you are in Lone Pine, a better way to do it is to ride Horseshoe Meadows first, then finish up Whitney Portal. Done this way you have a ride of 63 miles with 10,694 feet of climbing. From Lone Pine, head up Whitney Portal Road. The gradient varies, but there’s a lot of 6-7%. In front of you all the time is the view of the road switchbacking across the mountain face. As you approach this face the gradient increases painfully with lots of 11-13%. It eases slightly as the road slashes right then back left, but not by much. It’s only when you head back into the canyon that the gradient becomes less painful, although it’s still steep. Just under 2 miles along the side of the canyon you reach the Whitney Portal Store and the top end of the big one-way loop. If you have the inclination on the way down, turn left on Movie Road and ride 0.6 miles up to where it turns to dirt and you can see some of the Alabama Hills rock garden. A magnificent climb in the spectacular Sierra Nevada. It’s big and remote and wonderful. It’s about 15.4 miles with 5,250 feet of climbing. The road is good and there’s almost no traffic. The climb starts with a distinct desert feel but by about mile 9 it begins to feel more alpine. The finish is at the obvious viewpoint at the top, just after a cattle guard and a sign saying 9,200 feet.